LC Shape plate 19 is a thin metal plate with different patterns. If you want to realize a challenging polymer project and work with very thin sheets of polymer clay, this tool is a must-have. 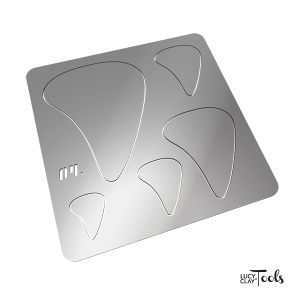 LC Shape plates are heat-resistant and can be baked with polymer clay in an oven. Due to its durable material (stainless steel), they are heavy-duty and can be reused many times (cannot be damaged by a cutting tool). There are different sizes of one pattern on each LC Shape Plate. Choose among different pattern shapes (for other patterns CLICK HERE). LC Shape plate will become your true friend and will help you with creating beautiful pieces. Look at the Inspiration Guide to learn more about shapes: CLICK HERE.